BZ-cyclone-separators are designed to clean the air, gas and steam. Steam, gas and air streams must be freed from liquid and solid parts for the operational and technical security. There may also be drops of liquid or dust, which have to be removed for environmental reasons. BZ-cyclone-separators are the best solution for this. Big cross sections of stream guarantee a trouble-free and nearly maintenance-free operation. On demand the condensate removal is effected fully automatic with the automatic HS-float by-pass capacitor. 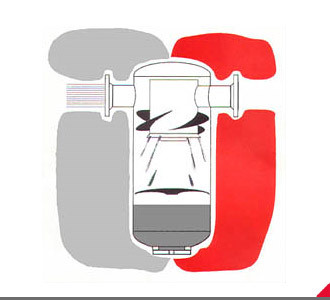 In the interior of each BZ-cyclone-separator everything centers on the “nozzle control device” (DLA). The nozzle control device (DLA) has exactly been calculated and designed for the indicated operation purpose with regard to its dimension, quantity and kind of impeller position stream technically by our process engineers. The air, gas or steam stream loaded with liquid and /or solid particles receives an enormous centrifugal acceleration by the “nozzle control device” (DLA). The particles in the volume stream are highly accelerated by the rotation (often several thousand times higher than the acceleration due to gravity) and are thrown against the separator wall. From there they slip into the condensate collector separated by the “shielding device”. The cleaned medium is deflected to the shielding device disc and leaves the BZ-cyclone separator by the central immersion nozzle of the nozzle control device (DLA). 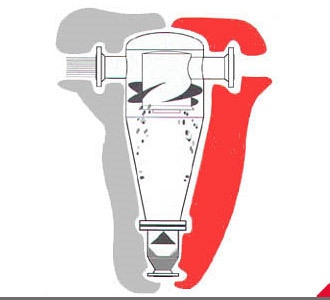 Only the BZ-cyclone-separator provides total separation of the separating area and the collector. In connection with different stream-technical detailed solutions our products have an untested technological position, which leads to unique separation results. Numerous variations of designs allow for an extremely economical pipelining. “BZ-cyclone-separators adapt to your pipeline” and not vice versa.